Pausa Cafè here takes its inspiration from Belgian Wheat Beer, containing wheat malt and spice. 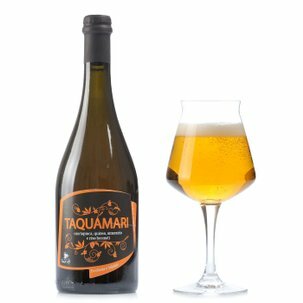 This creation is brewed using a wine yeast normally used for fine white wines, and adds a blend of spices and incenses. The result is a surprising wheat beer, with an opaque golden colour. Its spices take the nose by storm, embellished by strong hints of citrus. Rounded and charming in the mouth, with a fine balance between sweet and sour sensations. Alcohol 4.7% vol. Perfect with mildly spicy main course dishes, like chicken with lime and coriander, or a meat tartare with cumin and olives. Pausa Cafè is a social cooperative with a dual socially beneficial scope: on the one hand it supports activities favouring social and economic development in the Southern Hemisphere ruled by a sense of equity; on the other hand it offers inmates in the prisons of Saluzzo and Turin an opportunity for social reintegration and employment. And so it creates coffees, beers and cocoas that are both delicious and humanitarian!